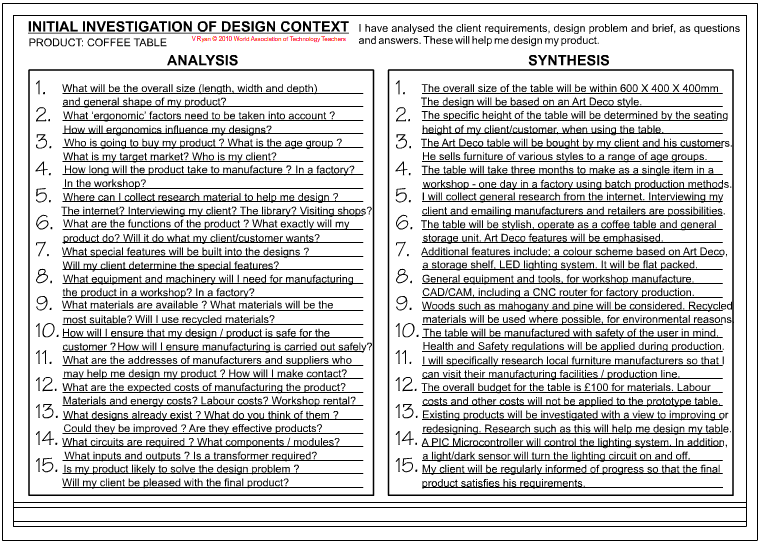 The ANALYSIS is one of the early sections in the design process. It involves listing as many questions as you can think of regarding your project. The questions will vary from project to project but usually the majority of these questions are the same, whatever the project you are attempting. The questions below may be useful especially if you adapt them to suit your current project. 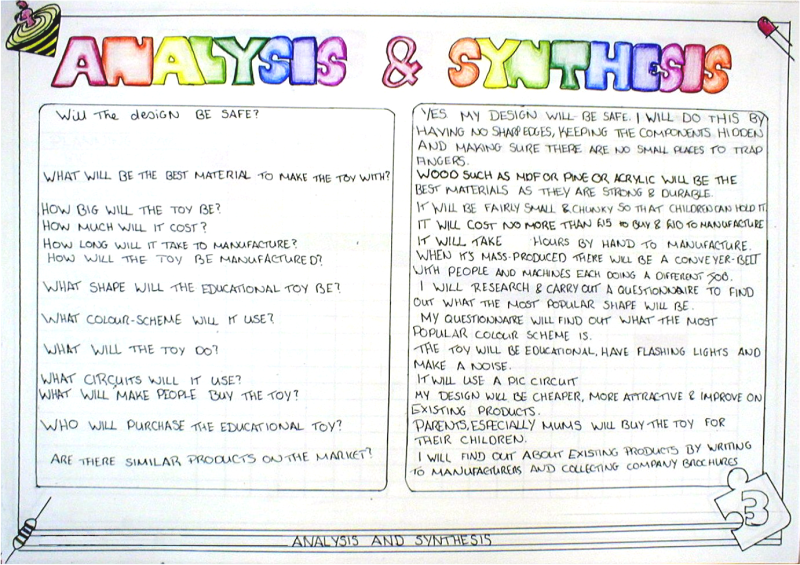 Remember the SYNTHESIS is the following section in the design process and is a list of answers. You may not be able to complete the synthesis until you have almost finished the entire project. 2. What materials are available ? What materials will be the most suitable? What will be the overall size ? 3. How long will the product take to manufacture ? 4. How will the product be mass produced ? On a production line ? What will the cost of ‘labour’ be ? 5. What is the best shape for the solution ? 6. What colour scheme will be most appropriate ? 7. What are the functions of the product ? 8. What type of circuit is required ? Is a timer required ? Are flashing lights needed ? 9. What special features need to be built into the designs ? 10. What ‘ergonomic’ factors need to be taken into account ? 11. What designs already exist ? What do you think of them ? Could they be improved ? 12. What are the addresses of manufacturers and suppliers who may help me design my product ? 13. Where can I collect research material to help me design ? 14. Who is going to buy my product ? What is the age group ? 15. Is my solution likely to solve the design problem ? 16. What equipment and machinery will I need for manufacture ? The analysis shown below has been produced for a project based on an educational toy . 1. A full range of questions are entered under the title of analysis. The answers are not needed at this point. Normally the questions are numbered and you should aim to have between ten to twenty. 2. The analysis is normally placed on the right and the synthesis on the left. Each question and answer should have the same number. This means that both answers and questions follow the same sequence. 3. Always keep in mind the project / theme when listing the questions. Do not add questions that are unrelated to the design problem / brief. 4. Keep each question ‘to the point’ / straightforward. Each question should be easy to understand. 5. Look at the questions in the example opposite. They cover a range of aspects from materials to circuits / electronics. Make sure that your analysis is at least as varied. 6. Consider leaving some space so that more questions can be added as you progress through the project. You will find that many more questions come to mind in the weeks to follow. A. Begin by roughing out a list of questions relating to your design problem. 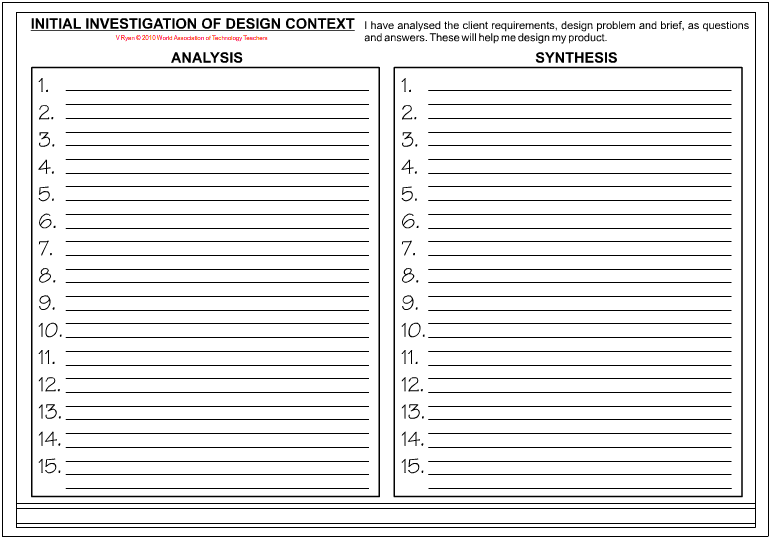 This will help you plan the layout and content of your analysis / synthesis sheet. B. Do not copy questions directly from other pupils or books. This could be regarded as ‘cheating’ by the examiner. Look at the questions posed by other pupils/ books and put them in your own words. C. Ask the teacher for advice and look at completed projects for inspiration. You must add as many relevant questions as possible to the analysis. Remember, you should present both the analysis and synthesis carefully and it may be possible to put both on the same piece of paper. When you work through the project read the analysis constantly to ensure that you are considering all the questions you listed. You will find that the analysis will help you target problems with your potential design and solve them, one by one.